MSI is relying on Azure Active Directory to do it’s magic. Once you enable MSI for an Azure Service (e.g. Azure Functions), the fabric will create a dedicated Service Principal (think of it as a technical user or identity) in the Azure AD tenant that’s associated with the Azure subscription. 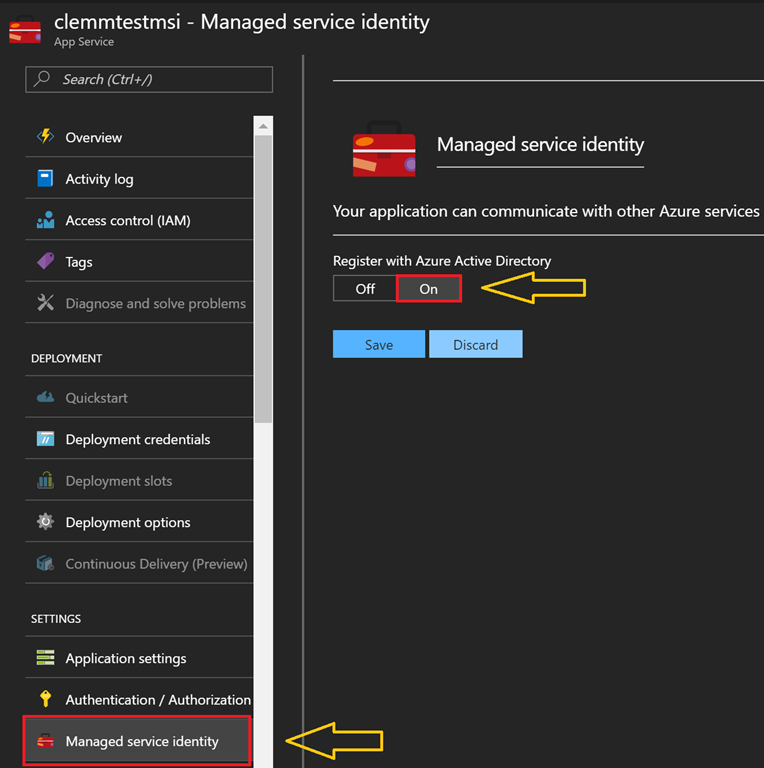 Your service instance ‘knows’ how to leverage this specific identity to retrieve tokens for accessing other Azure services that also support Azure AD-based authentication (like an Azure SQL Database). That experience is fully managed in terms of principal creation, deletion and key rotation, no more need for you to provision certificates, etc. The only thing you need to do is granting access to the service principal for the desired target service, as we will see later on. At the time of writing this post, MSI is supported for virtual machines running Windows or Linux and for Azure App Service incl. Azure Functions. 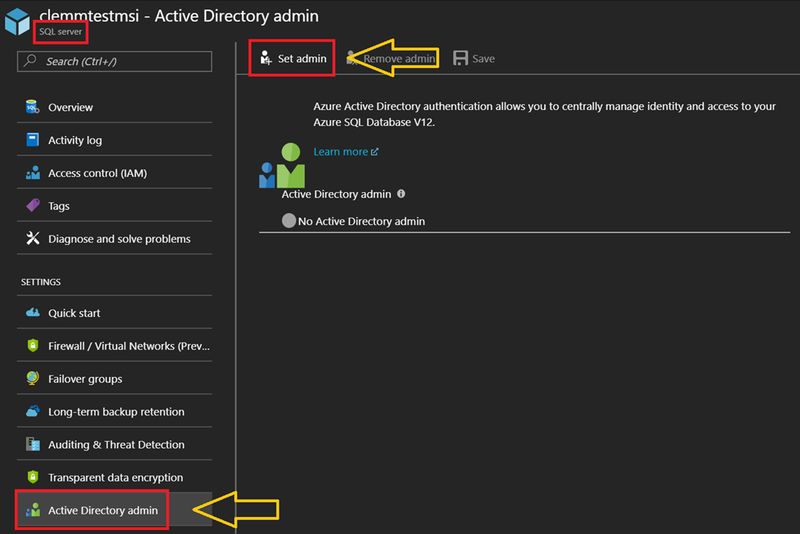 Authentication works for target services that allow authentication via Azure Active Directory (e.g. ARM, Key Vault, Data Lake, Azure SQL DB). 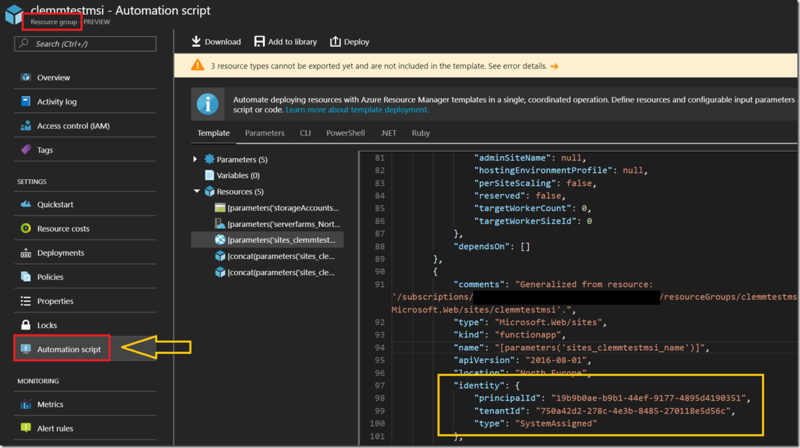 You now have a service principal in your Azure AD tenant that is associated with your Azure Function App. Also, the Function App has been enriched by some logic to use this principal internally for retrieving access tokens from Azure AD to be used with other Azure services, without having to mess with the principal’s credentials. So, where and how do I see my principal? In order to do so, let’s check the ARM template of the resource group our Function App resides in. Go to the resource group and navigate to ‘Automation Script’, as shown below. The JSON template contains a new ‘Identity’-section within the website resource, showing the attributes of the principal. This will show the specific service principal object created for your Function App, carrying the same DisplayName as the Function App. The object will also show up in the list of service principals in your tenant when calling Get-AzureADServicePrincipal. You will find two environment variables MSI_ENDPOINT and MSI_SECRET in your Function App environment (which you can check from the Kudu console). 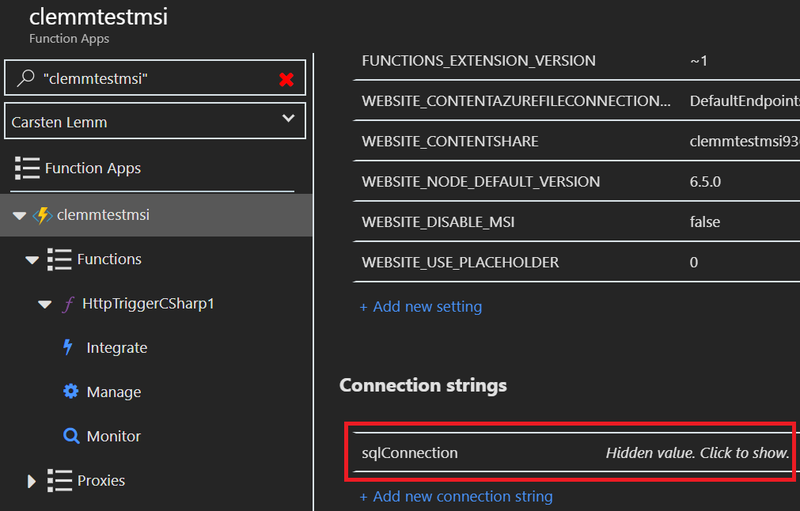 MSI_ENDPOINT is a local service (listens on a service-local address like http://127.0.0.1:41056/MSI/token/) that provides bearer tokens for the principal to be used for accessing an Azure resource like Azure SQL DB. In order to request a token, your code just needs to call this endpoint and specify the resource URI of the target service (e.g. https://database.windows.net/ for Azure SQL), together with the secret key stored in MSI_SECRET. 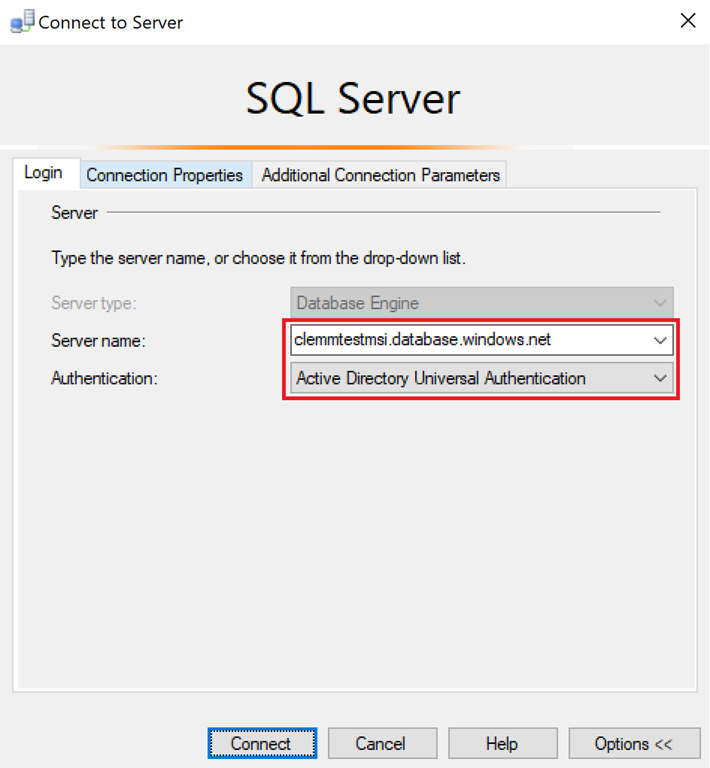 Note, that you need to specify the resource URI for the target service you want to access, in this case that’s https://database.windows.net/ for SQL Database. Running the function should plot the accessToken in the Function’s log output window. Violà, we now have a bearer token in our hands, representing the Azure Function instance! 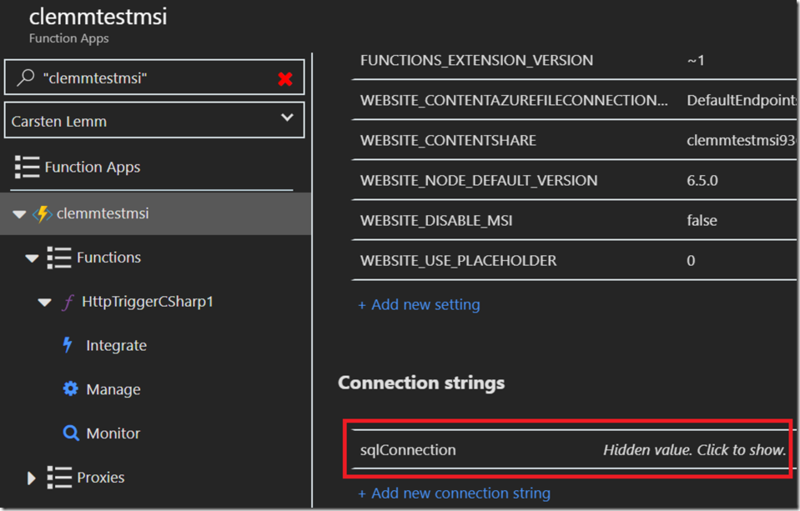 Behind the scenes, the MSI extension we activated for our Azure Function has automagically organized this token from Azure AD on our behalf, using the MSI_ENDPOINT and MSI_SECRET in it’s environment. In the next step, we can now use the token to authenticate against a database. 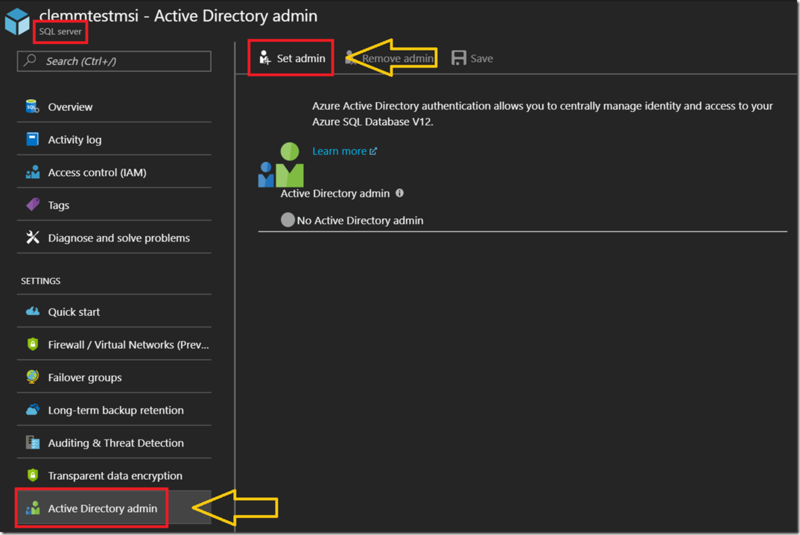 Go ahead and specify a proper user account from your Azure AD tenant. After that’s done, access to the database itself needs to be configured in terms of a contained user. At the time of writing this post, it is not possible to create a contained user for the MSI (i.e. the service principal) itself, so we need to take a detour in terms of doing that for an Azure AD group. Make sure to use the proper ObjectId of the MSI service principal. Now that we have the group and added the MSI as a member, we can finally configure access for the group in our target database. 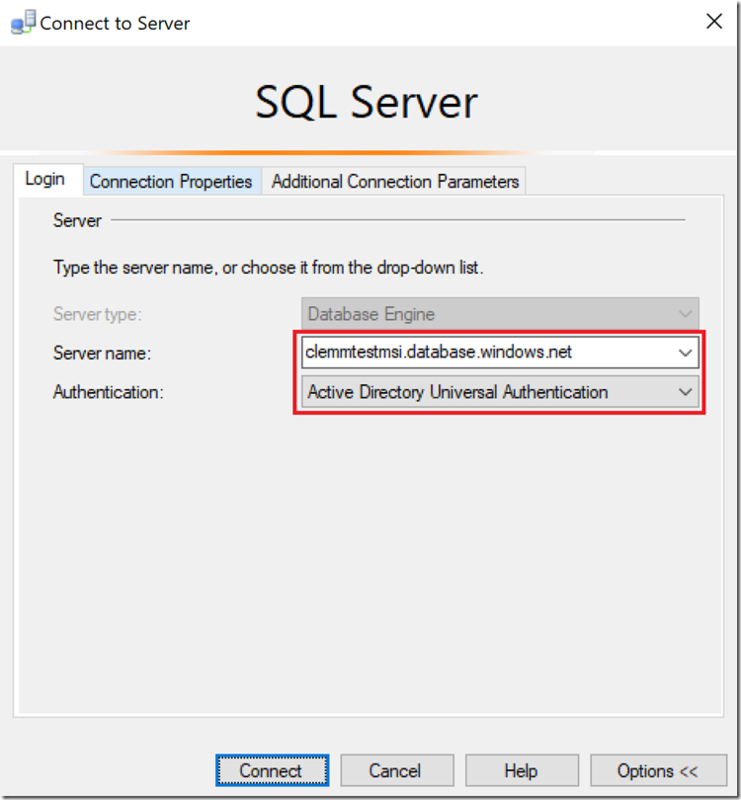 In order to do so, open SQL Server Management Studio (SSMS) and connect to the database using the Azure AD admin user we configured on the server previously. Make sure you enable access from your client in the server firewall first. This will create a contained user in the database and give it read access (if you need write access, just change the role assignment appropriately). The contained user object is mapped to the Azure AD group MsiAccessToSql containing the MSI service principal. Now, let’s write the code to access the database in our Azure Function and see if that’s working. In my case, I created a SQL Database based on the AdventureWorksLT sample, so I could read some records from the Customer table. 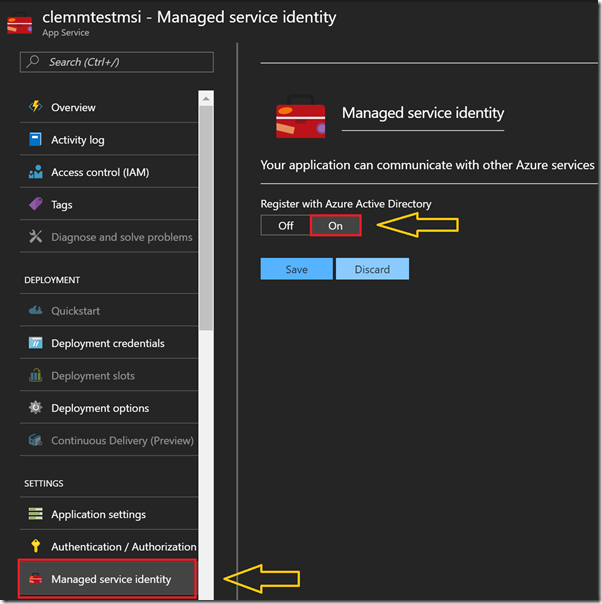 This post demonstrates how to use Managed Service Identity to keep secrets really secret and let the Azure fabric support you in taking care of the ‘plumbing’. Today, you can use MSI not only with App Service & Azure Functions, but also from Azure VMs. As target services, today it’s Azure Resource Manager (ARM), Azure Key Vault, Azure Data Lake, Storage and Azure SQL DB as shown in the example above. Over time, the list will grow and make Azure an even more powerful & secure platform as it already is today. Keep an eye on Azure documentation about MSI to stay up-to-date. This entry was posted in Azure AD, Azure Functions, Azure SQL Database, Microsoft Azure, Security and tagged Azure, Azure Functions, Azure SQL Database, Managed Service Identity, Microsoft Azure.